Good, clean, wholesome fun. Plus backstabbing. I don’t know about you, but I wouldn’t even pay five dollars to see the Eagles. Lyin’ Eyes was the most overplayed song of the 1970’s. Seriously, if I ever hear that song again, it’s possible that I might get violent. Anyway, you would think that Love would imagine the Beach Boys to be more popular than the Eagles. I guess he must be a self-effacing guy. He is still planning on having the reunion tour, although he will be the only original member of the band. That’s right, Love will be having a reunion with himself. Several years ago, I saw a reunion of Jefferson Airplane. It had two original members of the band, so I guess it qualified as a reunion of sorts. What Love is doing, however, strikes me as being the musical equivalent of one hand clapping. I’m disappointed and can’t understand why he doesn’t want to tour with Al, David, and me… We are out here having so much fun. 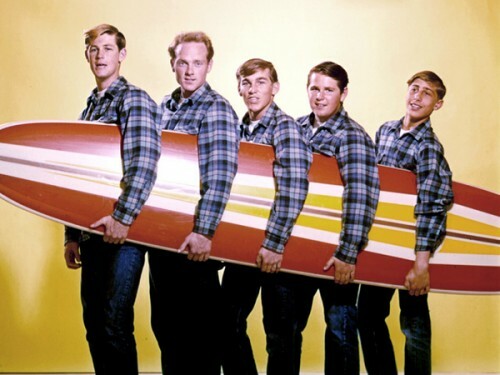 After all, we are the real Beach Boys. So, all Brian Wilson wants to do is have fun, whereas his cousin, Mike Love, wants to make money. Clearly, Love is the more serious person. I suspect that Wilson belongs to that 47% of the population that Mitt Romney says is sponging off the other fifty-three percent. (It’s perhaps worth noting here that Love is a Republican.) You can’t stop progress, Brian Wilson. If you don’t like it, start your own band. This entry was posted on September 27, 2012 at 5:17 am and is filed under 1960's, California, Capitalism, Music, Popular Culture, Republicans, Surrealism. You can follow any responses to this entry through the RSS 2.0 feed. You can leave a response, or trackback from your own site.